On Sunday, March 24, President Macron and his Chinese counterpart President Xi Jinping will stay between Nice and Monaco. Our 100% solar powered boat is blocked for this event surrounded by exceptional security measures. Our commitment to the energy transition naturally leads us to take stock of this president's visit, as well as examples of environmental decisions likely to be made by our leaders. This visit is part of a journey of the Chinese President, first in Italy to sign a memorandum of understanding on the project of the Silk Road. This will be the first agreement between a G7 country and China on this subject. Then will come the visit of Monaco. Here again, it will be a first, the first visit of a Chinese Head of State to the Principality. It should be remembered that during the summer of 2018, a remarkable exhibition on the splendor of the Forbidden City was organized at the Grimaldi Forum. Then a few months later, another exhibition on the glamorous myth of the Princesses of Monaco was organized in the heart of the Forbidden City in China. There is no doubt that these exhibitions helped to create ties between these 2 nations. After, the visit continues in France first on the Côte d'Azur, then in Paris. On Sunday, March 24, the two French and Chinese presidents will have dinner in the magnificent Greek villa of Beaulieu-sur-Mer, Villa Kerylos. On this occasion the ports of Saint-Jean-Cap-Ferrat, Beaulieu-sur-Mer, Eze and Cap d'Ail are closed for reasons of security. Many villas facing this place are also "visited" by the security services to assess any potential risk. Our solar boat seaZen is the only boat open this season, delighting new visitors who wish to discover the coastline off season. Our seaZen ship, finds herself de facto requisitioned for these exceptional guests since the marina is closed to the public! Finally President Xi Jinping will sleep in Nice, more precisely at the Hotel Négresco. From local sources, it seems that his personal bed is specially installed in one of the best suites of the hotel. The next day he will go to Paris. And what about the environment in all this? This 3-days state visit coincides with the 55th anniversary of the establishment of diplomatic relations between China and France. The officially announced goal is to consolidate the Franco-Chinese strategic partnership. At seaZen, we believe that the energy transition must be based as much on the change in consumption habits initiated by the public as on the impulse of states and regulations. Without prejudging in any ways, the content of the discussions that will take place, we wish in this article to retain some concrete examples of regulations that have a major responsibility for the transformation of sustainable mobility, which could inspire our governments. By 2021, phased in from 2020, the fleet average to be achieved by all new cars is 95 grams of CO2 per kilometer. This means a fuel consumption of around 4.1 l/100 km of petrol or 3.6 l/100 km of diesel. This is a revolution for car manufacturers, to take the measure, just see that the manufacturer Volkswagen will invest 30 billion euros by 2023, to develop electric cars. 30 billion invested by a builder, without the states having to spend anything, to move towards the energy transition. The risk is enormous for the industrialists and probably up to the climatic challenges. In France, the Renault Nissan Alliance invests heavily in rechargeable hybrid cars. It's THE absolute priority. Indeed, although far ahead of the electric car, with the Zoe or the Leaf, the 2 manufacturers have taken a clear delay on Hybrid cars. Yet the plug-in hybrid cars run on electric power for daily trips of 20 to 30 km and thermal for weekend trips. This is the ideal family car considering the technologies of the moment. At sea, and thanks to the weight of the European Union, the International Maritime Organization (IMO) has imposed for 2020, a cap of sulfur emissions from ships currently 3.5% to 0.5%. To achieve this, shipowners and port authorities are working hard to, for example, connect ships to the port power grid. This will allow them to avoid having to turn their huge machineries to port. It happens that it is precisely at the port that the engines turn into under-regime and therefore with degraded yields and very harmful emissions for the port populations. Pleasure craft is clearly the poor sector of the regulators. We do not understand the reason. It's enough to see the success of solar navigation, quiet and odorless, to understand just how much this new use actually meets the deepest aspirations of most of our fellow citizens. Since our launch in 2016, and after more than 1,500 customers, we have not consumed a kilowatt on the power grid and of course we didn't edited a gram of CO2. We hope that the dinner with two of the most powerful presidents in the world, in this villa Kerylos that our solar boat honors almost daily with its customers, will be a source of inspiration. The energy transition at sea will be all the easier as it will be accompanied by new uses more qualitative and at the best price compared to traditional navigation. 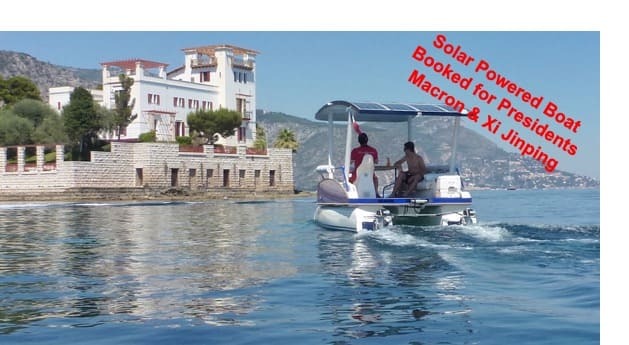 Presidents Macron and Xi Jinping are welcome to try out our Beaulieu's solar-powered catamaran that is booked for them all the day.